FC Barcelona Lassa were unable to secure victory against Galatasaray at the Palau (62-67), in a game in which the Catalans lead for large periods but their lack of accuracy in the final quarter condemned Bartzokas’ side to defeat. Even so, the game started with Barça switched on and playing well. They got off to a good start with three great Vezenkov baskets and with Tomic to the fore. Moreover, the blaugrana defence was on top form and they only gave two points away in the opening five minutes. 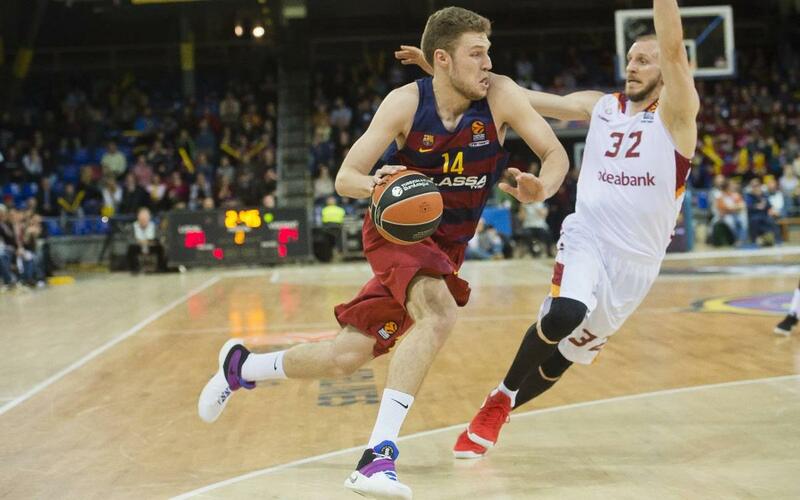 Slowly, the game became more equal but Barça Lassa dominated on the scoreboard. Vezenkov led the scoring in the quarter with eight points and Xavier Munford making his debut in the competition. The first quarter ended with the home side leading 16-10. Bartzokas’ players struggled to maintain their intensity in the second quarter and they failed to get any points for the first three minutes until Victor Claver scored a great smash. The Turkish side turned the scores around but two spectacular Koponen three pointers put Barça back on top. The Catalans went into the break with a deserved, yet small, lead (28-26). After the break, the blaugranas were back on their game with Vezenkov and Koponen with a three pointer apiece. Bartzokas’ side were still scoring well with Koponen, Tomic and Rice adding to the tally. However, Galatasaray, with Schilb leading the charge, didn’t let Barça move too far in front. Navarro appeared with a spectacular three pointer and, together with Munford’s basket, helped distance the Catalans momentarily. Fitipaldo got two points back at the death meaning the third quarter ended with a score of 50-45. The final quarter started with Galatasaray seeking to take control of the game with a 5-0 period helping them draw level. An impressive offensive rebound by Faverani served to curb the away side's momentum. However, Diebler’s three pointer and Alex Tyus’ basket hurt Bartzokas’ side who responded well through Rice and Vezenkov to take the lead once again with five minutes to go. Barça weren’t quite on form in attack and in defence they were unable to stop three consecutive scores from Schilb, Tyus and Diebler which changed the course of the game. Diebler and Vezenkov exchanged three pointers leaving both teams in it with a minute to go but with Barça chasing. In the end, the blaugranas were unable to close the gap and the Turkish side ended up taking the victory with a score of 67-62. The Catalans have the chance to bounce back when they play at the Palau once again against Manresa at 12.30pm CET on Sunday.